At casual glance it appears nearly identical to its predecessor, but it’s not. Inside and out, the new MacBook Pro 15-inch models—with speeds of 2.4GHz and 2.53GHz—have been remodeled, redesigned, and reengineered for a completely new laptop experience. While all the previous Macbook Pros felt rock solid, the new models seem even more so due to the brand new manufacturing process introduced with this generation of MacBooks ( ) and MacBook Pros. Instead of assembling the laptops piecemeal and expertly splicing the components together, the new models sport a unibody architecture that constructs the entire machine out of a single piece of recyclable aluminum. Such assembly, according to Apple, eliminates the need for fine-tuning parts and diminishes the possibility of construction failures. With the new MacBook Pro in hand, it feels almost like an extension of your arm. There’s no clasp keeping the lid shut: simply grip the thumbscoop etched into the bottom of the case, and it opens right up. Even without a clasp, it feels secure when closed. The unibody composition also makes these new laptops easier to service and fix, and great for do-it-yourself types who have, in the past, lamented how difficult it was to do things like swap out the hard drive or battery. The new MacBook Pro makes it very easy to access the battery and hard drive—move the lever on the bottom of the case, and you’re in. Upgrading RAM requires the removal of eight screws; the previous MacBook Pro had only three screws. The new MacBook Pro is slimmer than its predecessor. The 2.4GHz model comes with 3MB of shared L2 cache, 2GB of 1,066MHz DDR3 memory, and a 250GB SATA hard drive (5,400 rpm). The 2.53GHz model comes with 6MB of shared L2 cache, 4GB of memory, and a 320GB hard drive (5,400 rpm). Apple also offers a 7,200 rpm drive and solid-state drive (SSD) as built to order options. The new memory is the faster DDR3 variety—an upgrade over the DDR2 SDRAM that shipped in the previous models. Both have 1,066MHz frontside bus and built in AirPort Extreme Wi-Fi with 3-Mbps Bluetooth 2.1 + EDR. A new port makes its appearance in this model: the Mini DisplayPort, which connects to Apple’s new 24-inch LED Cinema Display ($899). You can connect other monitors to the new MacBook Pros, but you’ll have to buy a $29 Mini DisplayPort to VGA or Mini DisplayPort to DVI adapter, or $99 for a Mini DisplayPort to Dual-Link DVI adapter. The right side of the machine has the slot-loading SuperDrive and a Kensington lock slot. And if you’re using the lock, it automatically locks the access door underneath, thus protecting the hard drive and the battery. An elegant battery indicator on the side of the case glows green through eight tiny dots and when all is well and flashes five times when the battery needs replacement. Side-by-side, the difference between the current and previous models is arresting. The new chassis is slightly larger than the previous model at 14.3 inches across (compared to the previous 14.1 inches), and a tad wider too, though it’s also a shade thinner and more rounded at the edges to give it a more natural feel. It’s also about one ounce heavier, but nothing you’d notice by simply lifting it. Apple also quietly updated the 2.5GHz 17-inch MacBook Pro to include a 1,920 by 1,200-pixel screen (updated from the older 1,680 by 1,050 pixels), in either glossy or matte form. RAM has been increased from 2GB to 4GB, and hard drive size has increased from 250GB to 320GB. The standard drive is still 5,400 rpm, with (as before) the option of a 320GB 7,200 rpm drive. New to the 17-inch MacBook Pro, however, is an optional 128GB solid-state drive, as used in the updated MacBook Air (which ships in November). This review does not include the updated 17-inch MacBook Pro. There’s no longer a choice of screen finishes, unfortunately, and many will grumble about the glossy screen. Personally, the more I look at glossy screens (especially on laptops where they don’t remind me of a huge negative mirror) the more appealing they become. Not only is the graphical contrast visually striking, but these new screens show grayscale gradations that are virtually undetectable on matte screens. They also have a 3-D quality that makes everything on-screen burst with energy and vivid color. But some people will not like that, and it may cause eyestrain for others. I do wish a matte screen were offered as an option. You can switch off between these two chips to get either better video performance or longer battery life. While you have to log out and then log back in to switch graphics chips—and some people might complain that you can’t simply switch on the fly—it seems like something you’d decide beforehand depending on how you’re planning to use your ‘Book. For people who use their MacBook Pro in a home or office setup, plugged in and attached to large monitor and separate keyboard, the higher performance graphics mode makes sense because they’re not concerned with battery life. However, when traveling, say, on the plane working or watching a movie, then switching to the integrated graphics chip will conserve battery life. For gaming or other graphics intensive operations, the Higher Performance mode would be the way to go, regardless. You can change your settings via the Energy Saver preference (whose icon has changed from a standard light bulb to a cute energy-saver style compact florescent). While it appears to be identical to its predecessor at first glance, this MacBook Pro has been remodeled both inside and out. It sports a new unibody architecture similar to the MacBook and MacBook Air enclosures. The matte screen option is gone, replaced by a glossy 15-inch screen. The latest MacBook Pro also employs Nvidia's Hybrid SLI technology, a pairing of two graphics chips-one integrated in the motherboard (GeForce 9400M) and the other discrete (GeForce 9600M GT). This model features a slightly faster processor--2.53GHz vs. 2.5GHz--than its predecessor at the same price. While it appears to be identical to its predecessor at first glance, this MacBook Pro has been remodeled both inside and out. 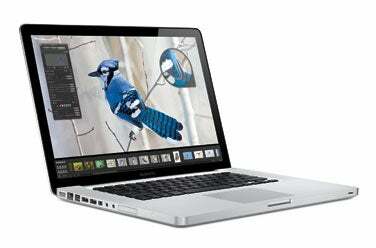 It sports a new unibody architecture similar to the MacBook and MacBook Air enclosures. The matte screen option is gone, replaced by a glossy 15-inch screen. The latest MacBook Pro also employs Nvidia's Hybrid SLI technology, a pairing of two graphics chips-one integrated in the motherboard (GeForce 9400M) and the other discrete (GeForce 9600M GT). The processor speed remains unchanged, as does the price for the 2.4GHz model.